Aragonite mineral clusters and rosettes show great crystal twinning. Aragonite has a white streak, glassy luster, low to moderate hardness. These samples are a beautiful hue of red-orange. An information card with details on the mineral formation, characteristics and uses is included. Typical samples sizes are generally 1.5 to 2 inches in length or width but can vary based on availability and natural crystal shape. Aragonite cluster samples are from Morocco. 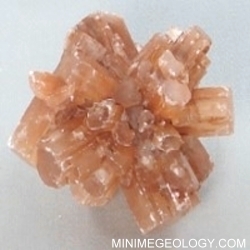 The photo shown is representative of typical aragonite clusters. The sample you receive may differ slightly in form and shape.